A central feature of NEM-Watch is the clearly recognisable map component, which has been developed (and refined over more than 10 years) to convey a significant volume of information, and make it readily understandable, in a single screen. The principal elements of the display are discussed below. Unless you are using Playback (or Playforward) the NEM-Watch display will focus on the current dispatch (or trading) interval – configured with this selector. a) A box within each region displays the region’s current level of demand. Each region is colour-coded to reflect the current level of demand compared to the historical* minimum and maximum demand for that region. b) A box outside each region displays the region’s current price. 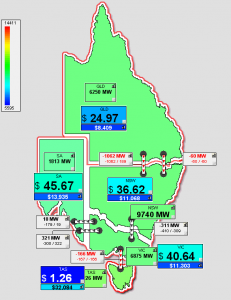 Each box is colour-coded to reflect the current price on a configurable scale (by default ranging from $0 – $150/MWh). c) Across region boundaries, NEM-Watch shows each inter-regional interconnector, with the arrows showing the direction of flow (note that the arrows turn red when the interconnector is constrained). d) Economic islands are single regions or groups of regions in the NEM that are economically separated. In NEM-Watch, economic islands are shown by a red outline around the regions that are economically joined. 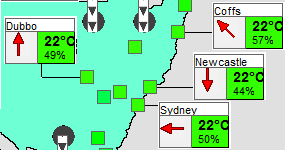 e) NEM-Watch displays the temperatures of 35 cities across the NEM, coloured to indicate the current temperature. Moving the mouse over a city will reveal further detail. f) Dam levels are displayed in their geographic location with an icon indicating the current level of the dam. Moving the mouse over a dam level will reveal further detail. 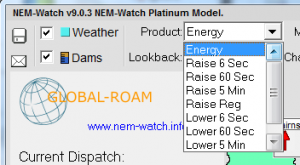 At the top of the NEM-Watch display there are four drop down boxes that allow you to customise what is currently displayed in NEM-Watch. a) The first box allows you to select the commodity. Choose from energy or any of the FCAS commodities. b) The second box allows you to choose to display Dispatch or Trading periods. c) The third box allows you to change the screen resolution of NEM-Watch. 1) Click and drag most boxes (price, temperature, interconnector) to move them where you would like to see them. 2) Click on temperature icons, dam icons, and interconnectors to permanently display more detail. 3) Use the “Options” menu to configure default colours and other parameters. NEM-Watch will prompt you to save all these configuration changes, so you can revert to this new default setting when restarted in future. If you are displaying NEM-Watch in a common area (e.g. a visitors center) where you’d like to ensure that your settings are not changed, you can use certain keystrokes to lock the display. Please let us know if you would like to know how to do this and we’ll share the secret with you!